Since a storm cancelled our class, I will use this week’s post to go over a few meditation techniques that are intrinsic to the class, but not usually mentioned in the blog. Should any of you who are blog followers like to join the class, let me know. We turn off our cell phones and give ourselves over to this time we have claimed in the day. Although we are a group of women who have many responsibilities and we arrive at the class at the end of busy days, we let this be a sacred time out of that busy-ness. We recognize that if we give ourselves this time, we can return to our responsibilities totally refreshed and better able to cope with whatever arises. We recognize that in this time we have claimed for ourselves, there is absolutely nothing right now for which we are responsible. Before we start our meditation, we each take a moment to stand and stretch whatever in the body calls out to make one last movement before sitting. Whatever movements we make, we do them from a very interior receptive place, sensing into the body, really feeling the muscles, the energy body, our emotional and mental state at this moment. We notice how we are arriving, and we use this opportunity to gather our thoughts into focus on this moment. Some students find doing a little deep breath work helps to create spaciousness and release the thoughts and images that linger from their busy day, making room for meditation. Try it and see if it is something of value to you. Take a deep breath and really release it, adding a sound on the exhale if that feels right, really letting go of all holding. This can be a valuable tool, but one that isn’t entirely portable, since you probably won’t want to do it in an airport waiting area. So use it if you like it, but don’t depend on it. When we are sitting, we want the buttocks to be higher than the knees. Sitting on the floor, this means using enough cushions to make it so the knees can touch the floor. This cross-legged position does not work for all bodies. It certainly doesn’t work for mine. When I am sitting on the floor, I use a zafu (round sitting cushion) on end and let it support my buttocks as I sit in a kneeling position. We want our spine to be as vertical as possible, creating an open channel for the easy flow of breath. We want to let our skeleton hold us erect so that we may relax our muscles. If we need to rely on our muscles to maintain our position, we will find ourselves in pain later on in the meditation. If sitting in a chair, it’s best to sit forward, with the feet firmly planted on the ground. The back can be well supported upright or not supported, but it shouldn’t recline, as this will hamper the practice. In our class in my home we are sitting on cushy couches that don’t create the best posture. We each take responsibility to be sure that we are using added cushions to support a more conducive posture. Depending on the position you are in, if you can tilt the pelvis slightly forward, like a bowl tipping to spill some of its contents, this will provide the strength to maintain your position. Let the skull find a seat of balance on top of the spinal column so that it will not be straining to stay upright. If you think you may get cold sitting, since the body will be still for quite some time, put on socks, add a sweater, or wrap yourself in a shawl or blanket. When we meditate, we are not closing out the outside world but releasing all the boundaries within ourselves that keep us feeling separate. We relax into an awareness of our body, opening to all the sensations present in our experience. This will be different from person to person, from moment to moment, but in general we sense in to the overall energy first. We notice if our body is feeling energized or sluggish, for example. We can do a body scan, starting at the top of our heads and noticing where we are feeling tension. If we find tension, we can pause to sit with that sensation, make some small movements that might help to release and relax the tension, maybe breathe into the area. This is not a fault-finding mission. Tension is a normal part of life. Tension is a knot attached to a story, however. So to the extent we can ease our tension during meditation, we may relax more spaciously into this moment, beyond our stories of other times and other places. Tension anchors us elsewhere. The breath and other sensations anchor us in this moment. Once we are settled and relaxed, we set our intention to be present in this moment. We set the intention that, when we notice that we are lost in thought or lost in a fog, we will bring our focus back to the present moment, the sensations in the body, the rising and falling of the breath. We set the intention to do this with great compassion, knowing that it is natural for the mind to think, so no scolding is necessary, and in fact scolding would simply take us off into another thought cycle. Every meditation is different. Letting go of expectation, we open to what arises in this moment. We notice sensations first and foremost, but we will also become aware of thoughts, moods, emotions as they pass through. Whenever we notice them, we expand our awareness so that there is room for all of our experience. We may get bored. We notice boredom. We notice where we feel boredom in our body. We may feel achy. We get interested in the complex symphony of sensation within that sensation we had simply labeled ‘ache.’ We may find ourselves judging the experience, or judging ourselves. We notice the judging, notice here we feel it in the body. Is there some tightness that goes with the judging? We sense in to the tightness. And so it goes. Whatever meditation we have is the right meditation for right now. Some students have previous meditation training, and typically they will have been given a mantra as part of TM training. Mantras are fine. A repeated word or phrase is a fine practice. But allow the mantra repetition to keep you present, not take you away in some quasi-dream state. Students often prefer these dream-states, seeing them as ‘real’ meditation. Whatever experience you have is fine, but for the purpose of our work together, we do Insight or Vipassana meditation. Going into a dream state is like a nice vacation, getting away from daily life, getting a good rest, maybe having some intense psycho-spiritual experience. These are all valuable in their way. But it often seems that people who meditate in this way are easily overwhelmed when they return to their lives from this mini-vacation. 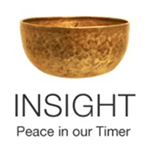 Insight meditation is learning how to live daily life with joy, being present for all that arises, so that you don’t have to ‘escape.’ It is seeing the spiritual richness in even the most ‘ordinary’ moment of life. That said, in our class we have some mantras that we enjoy singing out loud together for the last few minutes of the meditation some times. Sending metta (loving kindness) is a lovely addition to any meditation. This can be the meditation itself, beginning with yourself, “May I be well, may I be happy, may I be free.” Then extending it to someone it’s easy to send metta to, then someone neutral, then someone challenging, then all beings. I happen to have the most deliciously toned Buddhist bell bowl, featured prominently at the top of this blog. When it rings it sends out such sweet sounds out into the silence, touching the depth of the clear pond of our experience. I ring it three times, and then we bow. Bowing is a way of honoring our practice, honoring each other, and showing our gratitude for this opportunity to awaken. This is where I give the dharma talk that I later post on this blog. There is often discussion that arises and the sharing is very rich. This entry was posted in awareness, begin to meditate, body scan, breath, class, http://schemas.google.com/blogger/2008/kind#post, intention, mantra, posture, sitting on October 15, 2009 by Stephanie Noble.